During the #WFUThrive event, there will be an Instagram contest. Up for grabs are eight nice prizes representing the eight elements of wellbeing as defined by WFU. Every 15 minutes, a picture will be posted of a prize hidden among the Thrive festivities on Manchester Plaza. This picture will be posted to Instagram and announced on Twitter with some detail about its location. 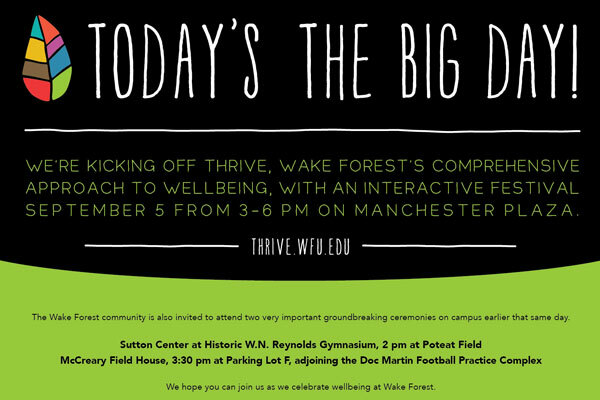 Once a person finds the prize, we request they take a selfie with it and post it to Instagram tagged with #WFUThrive. All students, faculty and staff are eligible to win.